I’d say I’m more of a vegetable than fruit girl. And since I have to pretty much force myself to eat fruit, I often end up with a lot of distressed fruit in my house. Next to bananas (that is another story entirely), among the distressed are most commonly apples. Therefore, I’m always looking for yummy things to do with overripe apples. 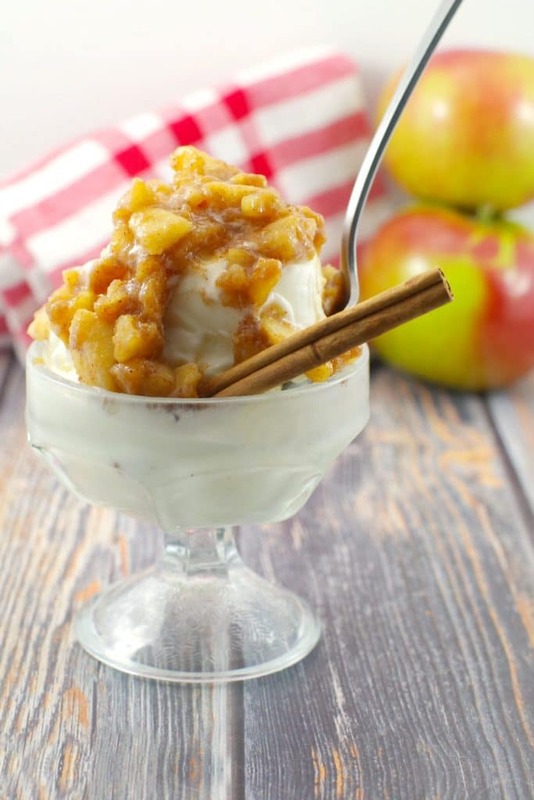 If you’re the same, then this Apple Cinnamon Topping recipe is for you! This recipe was inspired by the Cinnamon Apple Topping I had at IHOP in the United States years ago. But I wanted to reduce the calorie count and make a Weight Watchers friendlier version, so here it is! This apple topping makes a great topper for pancakes, waffles or frozen yogurt, ice cream, nice cream or greek yogurt. It is unbelievably delicious and I have cut the points to 4 WW fsp! But I need to be clear about something….this isn’t some boring old apple compote, which is, in essence, just chunky apple sauce anyway. This topping has much more depth of flavor; it’s rich and buttery with maple undertones. There are some things you can only get in the States and IHOP food used to be one of them. We always used to hit an IHOP on our summer vacations and that’s where I fell in love with this apple topping. Sadly, although we now have IHOP in Canada, the Canadian IHOP doesn’t have any apple topping on their menu. Apples don’t seem to last very long and I’m always trying to find things to do with them, along my other distressed fruit so that they don’t go to waste. I love this recipe because it’s quick and easy to make. It’s a good thing that’s the case because it only lasts about an hour in my house! I also put distressed fruit to use in my Sugar-free Pure Fruit Popsicles or make Apple Pie Cookies with overripe apples! So I’m urging you, before it’s too late, save your distressed apples and make this amazing Weight Watchers Apple Cinnamon Topping! This Apple Cinnamon Topping is inspired by IHOP's Cinnamon Apple Pancake topping. But I’ve reduced the calories and made it Weight Watchers friendlier @ only 4 freestyle smart points per serving. So, if you're looking for a way to use up your overripe apples or simply have too many apples, this Apple Cinnamon Topping is perfect on pancakes, waffles, yogurt, frozen yogurt or ice cream! Add all ingredients to a medium sauce pan. Stir over medium heat about 10 minutes until apples are very tender. Serve apple topping over warm pancakes. Great idea for pancake topping! I like. Some syrup but it’s nice to have fine thing different! Ah ah, I love the apple begging to be saved! 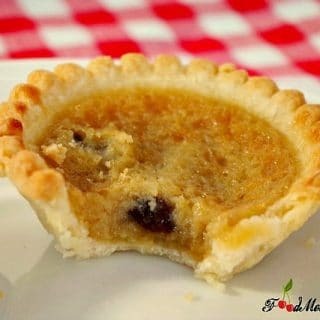 This is a great recipe and one that we will surely find a good use for 🙂 . Loving the flavors, not boring at all! It’s funny – I love fruits and vegetables, but I definitely prefer to transform most of them into something rather than eating them as-is, apples included. I kind of push myself to eat them on my own, but I just love to chow down on something that’s been transformed into a recipe. Of course that means that I have a bad habit of letting things get a bit too old in the crisper too. I love the idea of this simple, versatile, easy to go to recipe. Also, I straight-up had no idea that there was low-sugar maple syrup. How about that. Cheers! Thanks, Sean! Yes, my fave low sugar maple syrup is E.D. Smith! We love fresh apples at our house, so they don’t ever get a chance to get old, but this delicious topping looks like a great reason to save some to make this recipe. The maple along with the cinnamon sounds so good, and I love that it’s not too sugary. 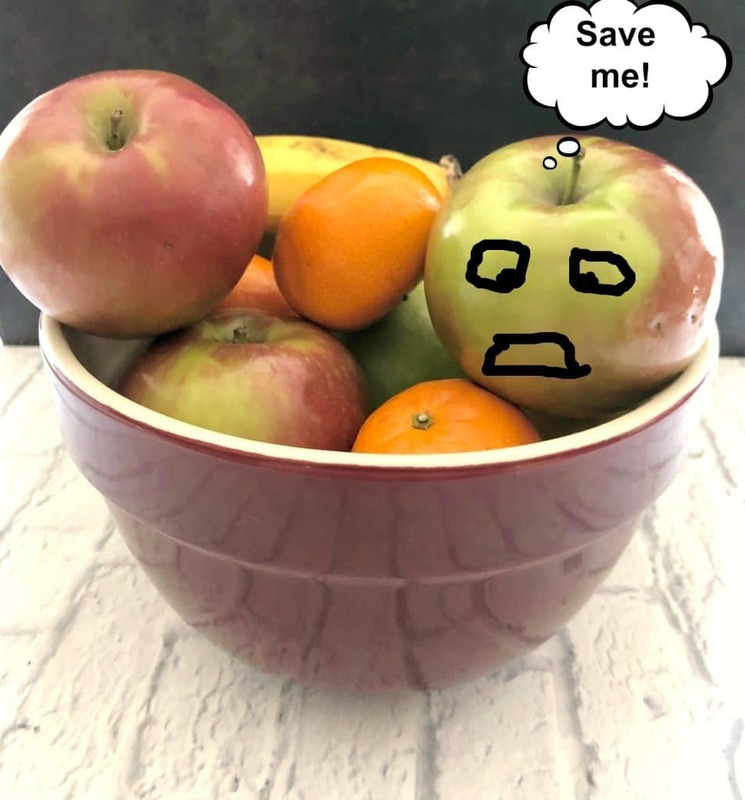 We are apple crazy around our place (we are surrounded by farmer’s markets and orchards), so apples do not get a chance to become distressed – my problem is we buy too many – I can’t help myself! So, I have to create ways to use some of them. :). 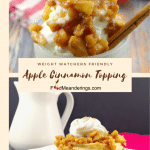 I love the idea of your Cinnamon Apple Topping – it looks so comforting and delicious, especially on those waffles! 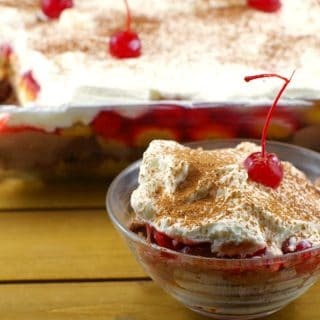 Thanks so much for coming up with a way to make the topping even more appealing with the WW friendly re-engineering Cheers!. Now you don’t have to feel guilty about buying too many, Denise! I want to make a batch of pancakes or waffles right now just so I can try this apple cinnamon topping! Love that it’s on the healthier side, and who doesn’t love apple cinnamon as a breakfast or dessert topping!? Haha… thanks Leanne! I hope you enjoy it – it really is awesome on all those things, but especially Chapman’s vanilla frozen yogurt!